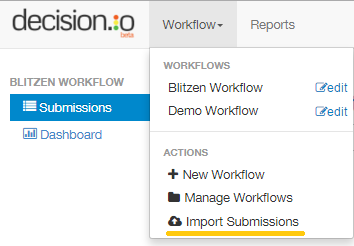 One use of the webhook feature in the Workflow Builder is to allow you to sync form submissions from Blitzen to Decision.io for group or committee review. This articles assumes you have prior knowledge of both Blitzen and Decision.io. Before you begin, feel free to brush up on your Decision.io basics here. To use this webhook you first need to have created a form in Blitzen (How to Create a Form). Having submissions is not a pre-requisite. Log into Decision.io and click your name in the top right corner, in the drop-down go to system administration. 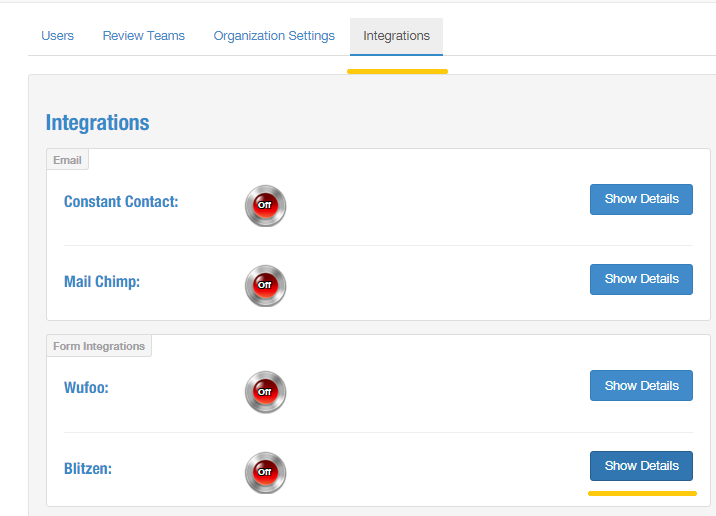 Then go into the 'Integrations' tab and click 'Show Details' next to the Blitzen name. The light beside the Blitzen should turn green and it should say 'On'. If this did not occur please check your credentials and try again. If you have forgotten your subdomain or password see this article. In this step we are going to update Decision.io categories used in the review process to reflect the new submissions. If this is the first time you have integrated a Blitzen form please create a new workflow first. See this article for information. (Please note that 'Workflows' used to be called 'Portfolios'.) Once you do that, you are ready to update workflow categories. Go to the 'Workflows' tab in the top bar and click 'edit' on the workflow you wish to update. A window will pop up. Click on the 'Categories' tab. The reason we may need to update workflow categories is because the existing categories may not reflect the Blitzen form fields we are trying to integrate. In this step we will map the fields from the Blitzen form to Decision.io review categories. Go to the 'Workflow' tab and click 'Import submissions'. You will then be taken to the page where the magic happens! First you will be asked to choose the desired workflow. Then you will be asked to choose the submission source. Click 'Add Blitzen Source'. Use the menu to select the Blitzen form you wish to integrate into Decision.io. You will then have to map the Blitzen form fields to the Decision.io categories in the 'Review Layout' section. Just drag and drop the fields into the applicable category boxes. A field can go into the layout as many times as needed and you can put multiple fields into the same category. For example a name might go into 'Quickview' as well as the 'Contact' sections. Once you have got the mapping to your liking scroll down to the 'Save & Import' section. Give this template a name and click either 'Save Layout & Import Submissions' to sync a form with existing submissions, or 'Save Layout with Webhook Endpoint' to only sync future / forthcoming submissions. (The last option is for those of you who do not have any submissions yet). 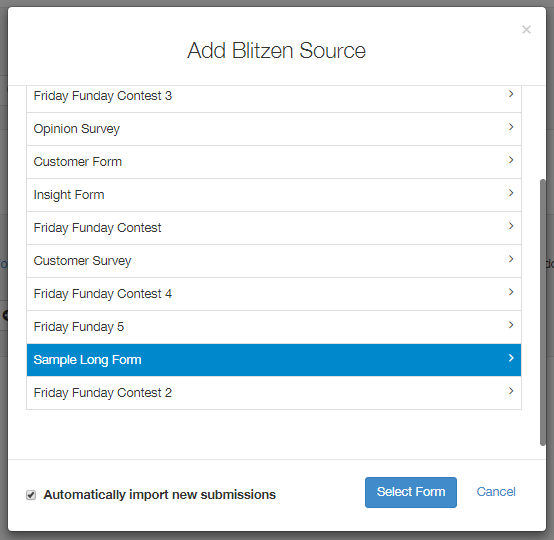 If you click 'Save Layout & Import Submissions' the Blitzen form submissions will automatically sync to your decision.io account. Nice work, your journey ends here. If you click 'Save Layout with Webhook Endpoint' there's one more step for you. Decision.io will then generate a unique URL (endpoint) which Blitzen will know to send future data to. To find this URL go to 'Workflows' > 'Edit' (desired workflow) > 'Blitzen' tab. Copy this URL. In this step we will send the data from the Blitzen form to the endpoint (URL) we generated above. We do this through a workflow. If you already have an existing workflow just update it (skip to the configure step). At the top of the right panel, select an input. This must be the form you wish to integrate with decision.io. A text-box will pop up where you can paste the URL we generated in decision.io. Choose the option "Post as x-www-form-urlencoded".